This may be one of the funniest lines, to me, in this book by Virginia Smith. 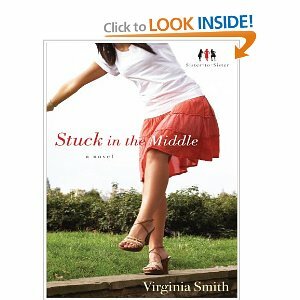 Stuck in the Middle is the first novel in her Sister to Sister Series. Joan’s just come out of a nine year relationship, she’s still living in her own hometown (although that’s by choice), and she feels overlooked and plain. And then she meets the handsome doctor that moves in next door and sibling rivalry, with the baby sister, takes over. It’s quite humorous as they fight for his attention, even the eighty something old grandmother flirts a little! 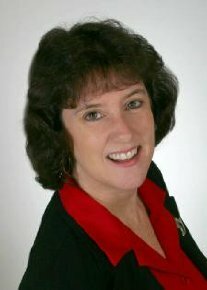 Joan is a Christian, but she realizes her relationship with God isn’t at all like the missionary who speaks at her church and not at all like Ken’s, the hunky doc. Her church is very traditional, but she doesn’t know anything else. I really liked her spiritual journey from just another gal sitting in a pew following an ordered service to actually having a personal relationship with Jesus. I got misty eyed when I read how God showed Joan just how much He specifically cared about her. It warmed my heart and gave me a reminder that He always hears our thoughts and loves us without abandon. He’ll even use our favorite ice cream, but you can read that for yourself! If you like a deep story with tons of humor and a sweet romance, then this is a book for you. Stop back by after you read it and if you’ve already read it, what did you think? Happy Monday, Friends! Don’t judge a book by its cover…but for the love, read the back!